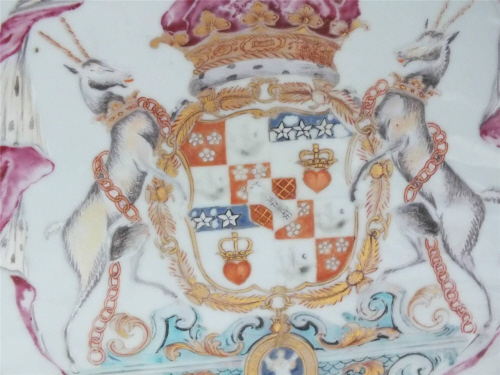 Ebay has another source of heraldic goods of interest I had previously overlooked, porcelain. 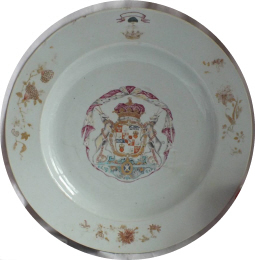 A 18th century plate bearing the Arms of the Duke of Hamilton & Brandon has just been sold. Arms: Quarterly, 1st and 4th grand quarters counter quartered 1st and 4th Gules three cinquefoils ermine (for HAMILTON) 2nd and 3rd Argent a lymphad Sable sails furled proper flagged Gules (for Earldom of Arran); 2nd and 3rd grand quarters Argent a man’s heart Gules ensigned with an imperial crown Or proper on a chief Azure three stars of the first (for DOUGLAS). Crests: 1 On a ducal coronet an oak tree fructed and penetrated transversely in the main stem by a frame saw proper the frame Or (for HAMILTON), 2 On a chapeau Gules doubled ermine a salamander in flames proper (for DOUGLAS). Supporters: Two antelopes Argent armed, unguled, ducally gorged and chained Or. Mottoes: Through (for HAMILTON), Jamais arrière (‘Never behind’) (for DOUGLAS). Arms: Quarterly Argent and Gules in the 2nd and 3rd quarters a fret Or on a bend Sable three escallops of the first. The most likely armiger is James Hamilton, 6th Duke of Hamilton & 3rd Duke of Brandon. In 1737 he married his third wife, Elizabeth Spencer, who was the daughter and coheir of Edward Spencer of Rendlesham, Suffolk. The latest edition of the College of Arms newsletter included the blazon for the Grant of Arms to Andrew Alexander Mitchell of Spalding, Lincolnshire in August 2013. I have added the details and my emblazonment to my Mitchell Armorial. Unfortunately, neither my clipart collection nor my artisitc skills are currently up to reproducing the same “handcuffs/manacles” displayed in the newsletter. One for my “to do” list. I have added a new armorial for the surname Beveridge to the Heraldry-Online website. At the moment it consists of two English and three Scottish Arms. I understand that the Scottish law firm Beveridge & Kellas also have Arms. However, I have yet to get any details of the Grant or blazon.